DePaul School of Music is pleased to welcome pianist, composer and arranger Ryan Cohan to campus for a concert featuring his freshly penned extended composition, Originations. Comprised of four connected yet distinct pieces, Originations incorporates a dynamic synthesis of Middle Eastern and other World music influences, classical compositional elements and jazz improvisation and is orchestrated for Cohan’s longstanding jazz sextet plus The Grant Street String Quartet. Spotlighted in the jazz chamber ensemble are the stellar talents of John Wojciechowski, Geof Bradfield, Tito Carrillo, Lorin Cohen, Juan Pastor, Jennifer Leckie, Eric Pidluski, Bonnie Yeager and Kerena Moeller. Originations has been made possible with support from Chamber Music America's 2014 New Jazz Works: Commissioning and Ensemble Development program funded through the generosity of the Doris Duke Charitable Foundations. 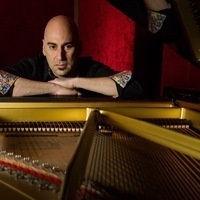 Motéma recording artist and Guggenheim Fellow Ryan Cohan has distinguished himself as a vital original voice to be heard amongst the elite pianist/composers on the global music scene today. Leading his own groups and as a sideman, Ryan has performed at premier venues worldwide and has worked with such jazz luminaries and stellar ensembles as Freddie Hubbard, Curtis Fuller, Joe Locke, Paquito D’Rivera, Bob Cranshaw, Victor Lewis, Jeff Hamilton, Orbert Davis and The Chicago Jazz Philharmonic, Kurt Elling, Jon Faddis, Pat La Barbera, Andy Narell, Regina Carter, The Chicago Symphony Orchestra, MusicNOW Ensemble, The Chicago Jazz Ensemble, The Grant Park Symphony Orchestra, Otis Clay and The Chicago Chamber Musicians among many others. Ryan has written extensively for and toured with NEA Jazz Master Ramsey Lewis, contributing more than a dozen pieces to several of Mr. Lewis’s albums and the theme music to Lewis’s nationally syndicated television show The Legends Of Jazz. In 2013, Ryan penned orchestral arrangements for master vibraphonist Joe Locke’s live concert recording, Wish Upon A Star (Motéma, 2013) featuring Lincoln’s Symphony Orchestra and recorded with Locke’s quartet on his CD release, Lay Down My Heart: Blues and Ballads, Vol. 1. Leading his jazz quartet, Ryan has embarked on multiple extended tours for the U.S. Department of State in Africa, Europe and The Middle East serving as a cultural ambassador along with his group. Ryan has produced five critically acclaimed albums of all original compositions: Real World (Real World Music, 1997); Here and Now (Sirocco Jazz, 2001); One Sky (Motéma, 2007) which was hailed as one of the best recordings of the year by the Chicago Tribune and many other journals; and Another Look (Motéma, 2010) called “a model for modern jazz piano albums” by ICON magazine and The River (Motéma, 2013) which features Ryan’s sixty minute suite inspired by his travels in Africa. The River was performed at Millennium Park in Chicago to a crowd of over 8,000 and was selected for several prominent ‘Best of 2013’ music lists that appeared in publications nationally. As a prolific writer for over twenty years, Ryan has created original works ranging from solo piano pieces to full orchestral arrangements and has scored three independent films. In recognition of his work, Ryan has received the prestigious Guggenheim Fellowship For Composition, Sundance Institute’s Film Composer Fellowship, four grant awards from Chamber Music America, The Aaron Copland Recording Grant, two Illinois Arts Council Fellowships, the Composer Assistance grant from American Music Center and three creative arts grants from The City Of Chicago. As an educator, Ryan has been on the faculty of The Skidmore Jazz Institute in New York, The Bloom School Of Jazz, held the position of assistant director of jazz ensembles at the University Of Illinois at Chicago and continues to work as an artist clinician at universities and high schools throughout the U.S and abroad. School of Music, Room 103 804 W Belden Ave.